The PCL (Printer Command Language) format was initially designed only for Hewlett-Packard inkjet printers in the 1980s, but in time it became a standard applied all over the printing industry. 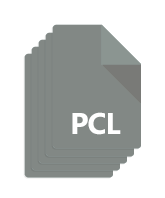 Though similar to PostScript in terms of features, PCL works faster and simpler. It is also less expensive, being an open language used almost universally by laser-jet printers. This entry was posted in Document conversion and tagged doc, dwg, HP-PCL, jpeg, PCL, pdf, printer on November 16, 2015 by reaconverter.